Real microphone with amplified voice effect. Introduces animals and their sounds; Twist the ring to select the animal; Includes 15 melodies to sing-along to; Style button changes music style: select classical, rock ‘n’ roll or jazzy. Motion sensor activities encouraging responses. General information: Styles may vary; Size H19.1, W15.2, D8.9cm; Batteries required: 3 x AAA (included); For ages 1 year and over; EAN: 50803787035. WARNING(S): To be used under the direct supervision of an adult. * 3617500 9.49. 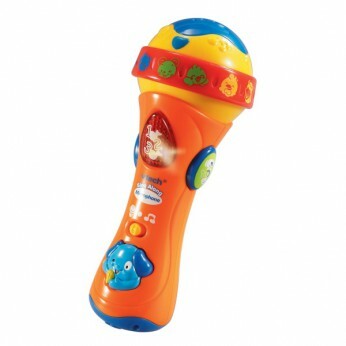 1 Question 1 Answer Little ones can take centre stage with the VTech Sing Along Microphone. This interactive microphone teaches tots about music and animals through fun songs and sound effects. Press the style button to choose from classical, jazz or rock ‘n’ roll, then turn the ring to hear different animals sing.The VTech Sing Along Microphone requires 3 x AAA batteries (included) and is suitable for budding rock stars aged 12 months and up. This toy costs approximately £9.99 (for the latest and best prices make sure you check our retailer list for the Vtech Sing Along Microphone above). In our review of Vtech Sing Along Microphone we classed it as being suitable for ages 1 to 3 years but recommend you check the manufacturer specific advice before purchasing.